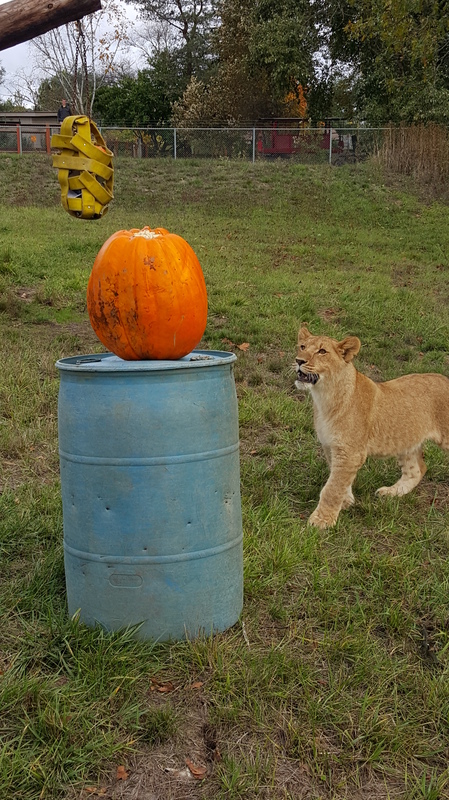 On Halloween weekend keepers got into the holiday spirit by giving out pumpkins! Our tigers, bears and lions all got huge pumpkins to play with, each filled with fun things like popsicles, maple syrup and other yummy snacks. 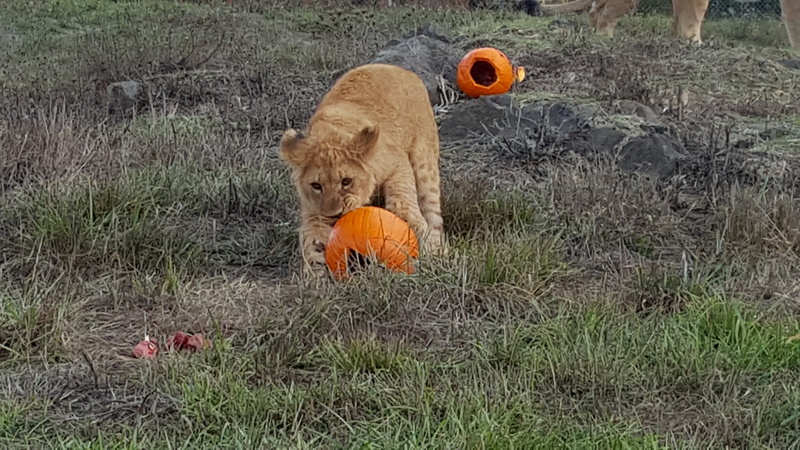 Many of our animals love playing with pumpkins – they can roll them, bite them, crack them open to get treats. The more exciting the enrichment the better, we love to see our animals playing and having fun. ‘Enrichment’ is what we call it when we give something exciting to our animals. Toys, fun foods, scents, boxes – anything that makes life interesting. Keepers tailor enrichment to each animal, considering how they would play with it or why they would find it interesting. Animals can play for hours with some enrichment, or curl up and sleep in it (mostly ferrets for that last one). Giving animals enrichment is an important part of keeping them healthy. It keeps them active physically with play, but also gives them mental stimulation. Animals get bored just like we do, and giving them something new or different everyday is a fun way to shake things up. Safety is number one for keepers, for people and for animals, so we make sure the toys we give them are safe. No choking hazards, things that will make them sick, or things they could get stuck in. Each animal has their favorite enrichment too. For example, our skunk loves things that smell, our tigers are big fans of elephant poop, and our cheetahs love exploring- so we move them regularly to other enclosures. It helps when keepers get to know our animals’ personalities. That way we can avoid giving them things they’re not interested in, or might be nervous around. Our Red Lored Amazon, for example, is scared of polka dots and the color pink… Now, we’re not sure that makes sense, but we respect his fears and his toys are always polka-dot-free! 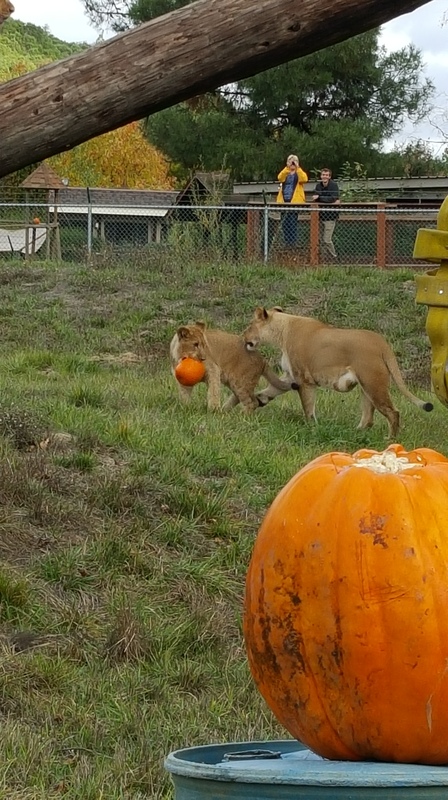 Our pride of lions took some time to warm up to their pumpkins, but once one cub went to investigate, the others jumped in! 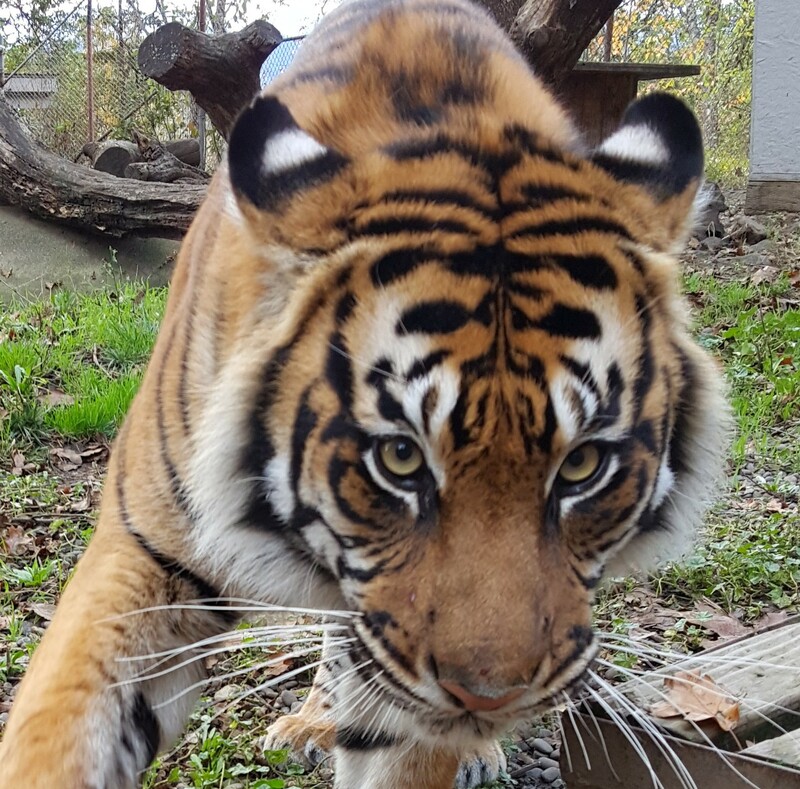 Our Sumatran tigers particularly enjoyed their pumpkins, going straight to stalk-and-pounce mode. Our Sumatran tiger, Riya, with her pumpkin.